THRED Outreach Launches: Join the Conversation! 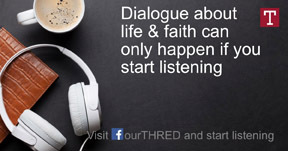 Lutheran Hour Ministries' newest outreach ministry, called THRED, launched Feb. 1 and invites people of all beliefs—or no beliefs—into discussions about life, faith, and Jesus. Add depth and perspective to the Easter season. Lenten Devotions from Lutheran Hour Ministries in English and Spanish are available now to begin your reflection on Jesus' ministry and passion. As young people see the power of the Gospel through ministry programs such as the Online Mission Trip, they are encouraged to be part of the Gospel movement to which we all are sent. God worked in amazing ways during this year's Online Mission Trip, and students responded! The idea driving the fifth-annual WORK DAY is to work at doing genuine outreach by getting out into communities and neighborhoods. The annual election to fill open positions on LHM's Board of Directors will open April 15. Beginning this year, contributing members of LHM must register by March 15 to be able to vote. Maria was struggling with depression when she heard a radio message produced by LHM—Venezuela that had a tremendous impact on her life. Choice Dollars designated to you during 2016 can be directed to nonprofit organization such as Lutheran Hour Ministries until March 31, 2017. Pray for Our Volunteer Teams as They Reach Out in Latin America! Lutheran Hour Ministries outreach centers in Panama and Guatemala have been hosting International Volunteer Teams over the past week. A team of 10 from Amazing Grace Lutheran Church in Oxford, Fla. has been serving our Panama center through Project JOEL, a VBS and some light construction tasks. A team of 11 from Faith Lutheran in Grand Blanc, Mich. has been assisting our Guatemala center—also through Project JOEL, VBS and some construction upgrades. Praise God for igniting in Christians here the desire to work alongside our staff and volunteers in Latin America! Join us in praying for safe travel, safety during their work tasks, and many opportunities to share the Good News of God's grace with people who need to hear. Pray for Lutheran Hour Ministries' SENT Outreach Conference! Lutheran Hour Ministries' SENT National Outreach Conference kicks off Thursday, July 24 in Detroit and runs through Sunday, July 27. Please join us in keeping LHM staff, speakers, workshop presenters, and participants in prayer. Pray for safe travel and good health; and ask God to send His Holy Spirit to move in the hearts and minds of these Christians—and to energize them to share the Good News of Jesus in their homes and communities! A Savior Who Fights for You! Satan is a bully, but Jesus is the Savior Who fights for you. Real help comes to us from the outside. In Christ, new beginnings and greater endings are still possible. Jesus is determined to meet you today with the water of grace only He can give. For more information, visit www.lutheranhour.org. ©1997-2011 Lutheran Hour Ministries, All rights reserved.